Shoulda stopped after 3 Doritos Locos tacos. Steeped in the kind of flag-waving jingoism we expect from someone like Peter Berg and destined to be a hit despite its gaping plot holes, Olympus Has Fallen proves that there is nothing more potent in the action film genre than a clever, workaday hero taking on a villain with more than mere evil on their mind. Call it Die Hard in the White House or just another example of cinematic wheel spinning, but the latest for Training Day‘s Antoine Fuqua plays like the perfect panacea for a 2013 winter filled with worthless mainstream drivel. Oh, make no mistake, this movie is no masterpiece. It’s clunky and obvious, declaring its motives from the minute we see Gerard Butler warming to the melancholy First Son. From then on, we know this will be one guy vs. an army, his skills and military smarts guaranteeing a last act fist finale with our chief baddie. Butler is Mike Banning, a Secret Service ace sent “down” to a desk job after a tragedy involving the First Family. He is married to a nurse (Radha Mitchell) who thinks the demotion has destroyed her husband’s drive. When a delegation from South Korea shows up to talk tensions with President Asher (Aaron Eckhart), it looks like international business as usual. Turns out, however, that the contingent is being led by a brutal terrorist named Yang (Rick Yune) who wants the U.S. out of the region so the North can overrun the DMZ. 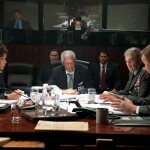 As his minions kill everyone in sight and block off access to the White House, it is up to Banning to help his boss (Angela Bassett), the Speaker of the House (Morgan Freeman) and a no-nonsense General (Robert Forster) gain intel into the situation and save the President. Of course, there may be a mole inside the Secret Service and just when you think everything is fine, a last-minute twist turns the tables on all involved. There’s no denying the effectiveness of Olympus Has Fallen. It’s fast-paced, loaded with bullets and bloodshed, and offers the otherwise enigmatic Butler a role tailored to his machismo and make-up. There are no excuses, just straight ahead red, white, and blue politics played out among some specious CGI and a whole lot of scenery chewing — most of which comes from Oscar-winner Melissa Leo as a defiant Secretary of Defense. Her moments are measured out in guttural groans and ear-piercing shrieks. On the other end of the star spectrum is Freeman, who makes playing the temporary Commander in Chief look like just another day in DC. He gets one great joke… and that’s about it. As for Yune, he has all the good lines, is shown putting the smack down on anyone who gets in his way (including the gals — boo!!!) and adds a level of suspense and tension Fuqua otherwise misses. We are supposed to worry here, feign a kind of fear that America will lose and that the Oval Office will become nothing more than a bombed-out reminder of a horrible National tragedy. But, again, everything is more or less laid out for all to see by the painfully cheesy script. Will Banning’s relationship with the First Son be important? You bet! How about those rumored tunnels blocked up by Truman in the ’50s. Absolutely. With dialogue as dopey as it is deliberate and a series of payoffs that compensate for the cluelessness elsewhere, Olympus Has Fallen remains a by-the-numbers crowd pleaser. It’s not smart, but it’s wise enough to know what works while attempting to avoid its own internal stupidity.